Even though Christmas has been over for a month, some stories need to be told. There are a lot of good folks in this world who quietly do a lot of good things.Mike Truluck of Oconee County was recently featured on 11 Alive in helping a family of anIraq vet reported by Wes Sarginson. Mike saw the article, got involved and involved others. They helped with Christmas and needs of a family of Russell Fairchild. Russell Fairchild was serving with Georgia’s 48th Brigade in Iraq when he was called home due to a divorce. Fairchild has 11 children and there was going to be no one to care for them. Thanks to Wes Sarginson, Mike Truluck and others, they got some help. As a longtime resident of Oconee County, I am not surprised by the effort and actions of Mike Truluck. He comes from great stock. 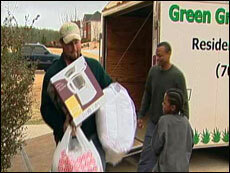 His parents, Don and Sue Truluck of Watkinsville have and now help countless folks in need. They do it without compensation or publicity. They do it for love. My family, with the longtime disability and death of Cousin Connie Barnette (March 2006), witnessed these fine people going “above and beyond the call of duty”. Oconee County and the larger world are fortunate to have the Trulucks and folks like them among us.AVOC commends them and thanks them and others who helped with the Fairchild Family.! Mike Truluck saw 11Alive's story on the Fairchild family, he knew his Christmas wouldn't be complete if he didn't do something to help.Clay & Tommy Daniel also helped. 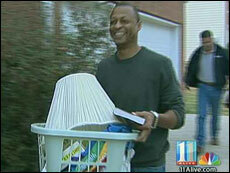 11Alive's Wes Sarginson first visited with Sgt. Russell Fairchild and his 11 children last summer. He was in the 48th Brigade of the National Guard, and was sent to Iraq. While there he was informed his wife wanted a divorce. He flew home to take over the family. Now, another special chapter in the Fairchild saga is a special Wes Side Story. The house note was $1,000 in default. Bishop Eddie Long's New Birth Church stepped in , took a love offering and fixed that. Friends and neighbors started organizing, and decorator Pam Slappy helped get new carpet and flooring. But there are still no beds. And the appliances mostly don't work. We watched the family dining on canned chili last summer, and told you how these kids were the best behaved best mannered we had ever seen. But now it is almost Christmas. Russell Fairchild really didn't have a plan for that. "All I had was $ for gas just yesterday, and my kids asked what are we going to get for Christmas, and I said I don't know, we're going to put it in God's hands, and it's not about gifts, it's the spirit of loving and sharing," Russell said. The Wal-Mart Foundation has been touring the country, going to military bases. They donated half a million dollars worth of toys to military families having a hard time. There was still a lot on the truck -- some HDTVs, iPods, toys. A week or so ago, a PR person asked me the ages and sizes of the kids. I called Russell and said I'm not sure what's up but give me the kids' sizes. There might be some clothes in some of the boxes that came on Thursday night, but the unwrapped presents got the Fairchild kids so excited they can only dream about the rest of the stuff. "All of this stuff is my dream-come-true," said young Christopher Fairchild. "These presents surprised me and I never seen stuff like this before in my whole life." We know one thing -- 2-year-old Bradley loves his truck. By the way, young Charity says to tell everyone they all said thank you. Anyone who wants to help the Fairchild family with furniture, can write to the C3 Center at 1065 Walther Boulevard in Lawrenceville, Ga 30043. You can also call Pam Slappey at (678) 622-1757. By now, many people know about Russell Fairchild who was serving with Georgia’s 48th Brigade in Iraq when he was called home due to a divorce. Fairchild has 11 children and there was going to be no one to care for them. Last week, the Wal-Mart Foundation helped take care of Christmas for the Fairchild children and workmen donated new flooring, carpeting and gave the house a fresh coat of paint. But there was almost no furniture in the Fairchild home and after Mike Truluck of Bogart, Georgia saw 11Alive’s story on the Fairchild family, he knew his Christmas wouldn’t be complete if he didn’t do something to help. Truluck is a Desert Storm veteran and as a father, he said he couldn’t imagine the pressure Russell Fairchild must endure day after day. “He’s got a huge responsibility with 11 kids. I’ve got three, [I’m] really touched just to do something. I didn’t know what to do, but I was [going to] do something,” said Truluck. Truluck told his Sunday school class at Grace Fellowship Church in Bogart about the Fairchilds and together they supplied the family with new furniture and a commercial-sized washer and dryer. Truluck didn’t just deliver the new washer and dryer, he installed it along with a new microwave oven, a picnic table for the kitchen, new pots and pans, dishes, silverware, new beds and mattresses. Truluck said the children were taking turns sharing a pillow and now they all have one of their own. Each bed came with new sheets, pillows, and bed covers. “It makes your heart feel warm, even if it wasn’t the holidays. There’s so many people in need that you know continuously, you need to help when you can,” said Mollie Defabio of Bogart, Georgia. But gifts for the Fairchild didn’t end there; each child was supplied with new toothbrushes and toiletries. “Well, a lot of people bought it, a lot of people chipped in and bought you all kinds of goodies,” said Truluck. Russell Farichild was almost speechless. “This is a learning experience for them. This is something they’ll never forget as long as they live,” said Fairchild. Truluck and his friends weren’t done; they plan to return next week with another truck load of supplies for the Fairchild family. Truluck and his Sunday school class reached out to get money for their first truckload and now they are reaching out again. Anyone that wants to help the Fairchild family can contact Truluck at miketruluck@charter.net. 11Alive’s Wes Sarginson has talked a lot about the family of Sgt. Russell Fairchild of Lithonia over the past six months, but this may be the final chapter in that touching story. Fairchild was called back from a deployment to Iraq after six months because his wife wanted a divorce. There are 11 children. House payments had not been made. Needless to say, it was an emergency. Bishop Eddie Long’s congregation at New Birth Missionary Baptist Church took care of the house payments, and so many 11Alive viewers took care of the rest. And that is Wednesday night’s Wes Side Story. There would have been a meager Christmas, but Wal-Mart and others took care of that. The house was a mess after all the neglect. Volunteers and carpet installers and painters took care of that. Last week, a small Sunday School class in Bogart, Ga., decided they could sit on the sidelines no longer. They brought in furniture, and bedding to the family. Nine of the children had been sharing one pillow and mattresses on the floor. Mike Truluck’s Sunday School class brought in brand new stuff -- bunk beds and a mega-sized washer and dryer. But when they made that first delivery they saw a lot more need, so they got more and delivered it on Wednesday. Don’t think for a moment, these people who helped Russell Fairchild will never see them again. Russell says he and Mike have spoken to each other on the phone for hours. And Mike says he admires Russell so much for what he has done. Both say they will stay in touch. Anything Russell needs, has to be pried out of him. He doesn’t ask for anything. So it was important that the Sunday School class observed and decided what was needed. “The didn’t have to do it,” Russell said. “I mean they have their own families, but they come out when the holidays is over with and see that there’s a need and everything they brought is a need, its necessity." They have the necessities -- partly because last week we posted a link from our website to Mike Truluck’s website and the response was what you are seeing right now. Maybe it is not a big story that so many people care about one family in need. But to those who had so little, it is life changing. It is inspirational. It is an answer to their dreams. And 11-year-old Christopher Fairchild said it best -- he said someday, he’s going to have some money, and he’s going to help somebody. My photojournalist, Richard Crabbe, has traveled with me a long time. Richard is only three years younger than me, but one of the kids actually asked if I was Richard's father! All kidding aside, we're all very happy for this family.